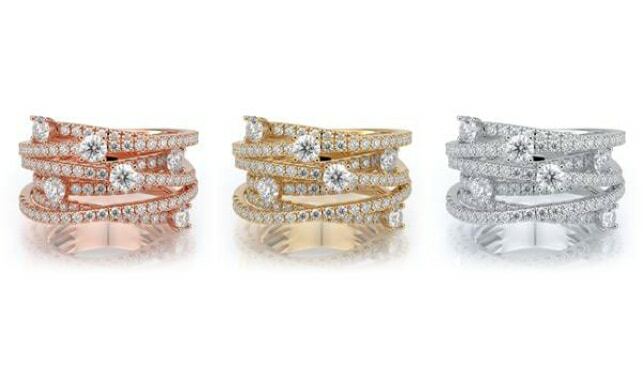 Jewelry simulation or rendering are nothing new, but they are getting increased traction as online jewelry shopping gets a bigger and bigger market share. Rendering enables jewelers to create simulations for many products, and has several clear advantages: Bigger stock, and significant saving in both time and money. 3D rendering is a three-dimensional computer graphics process which enables to automatically convert 2D models to 3D models that look realistic. The computerized process enables to create a simulation of any object, from homes to bridges, as well as products that do not yet exist. You could, for instance, simulate a non-existent building into a neighborhood, simulate a non-existent highway system in its surroundings, and even see how a certain ring would look on your finger – without ever touching it. The jewelry business has quickly taken to renderings. Rendering is highly effective in the design process, and enables jewelers to create models in 2D or 3D, and then produce realistic images of the piece from every angle with every type of gem or diamond, and in gold of every color. Jewelers can also choose the background of the image, including its color and texture. The entire process can be done in a few hours. When creating jewelry collections, jewelry companies or designers use pricey raw materials. The jewel’s journey, from the design process to its purchase by the end client, is a long and expensive one. So, instead of creating a model out of gold and precious stones, photograph it and offer to sell it online, jewelers can now create previews of their jewelry designs by rendering, thereby saving hundreds of dollars in costs. Rendering enables them to create, for instance, a model of a piece made of three colors of gold with a model ready to print for a fraction of the price. Therefore, they save both money and time. Rendering also enables designers to offer customers a wide range of jewel designs. Additionally, if a customer wants a say in his/her piece design, the jeweler can send them a 3D model ahead of production from multiple angles, in multiple colors, on the hand or against any background.